The reclusive Kingdom of Bhutan is well-known for it's pursuit of happiness, would this include taking time out for soaking in hot springs? 'Japanese love it [soaking in hot springs], if not for its medicinal value, for its warmth and therapeutic comfort. Visitors believe the thermal springs are great for relieving stress and tension too. Traditional medicine doctors (Dungtshos) in Thimphu [Bhutan's capital], though, say that it is not good for people with high blood pressure, eye and dizziness disease, and with heart ailments. 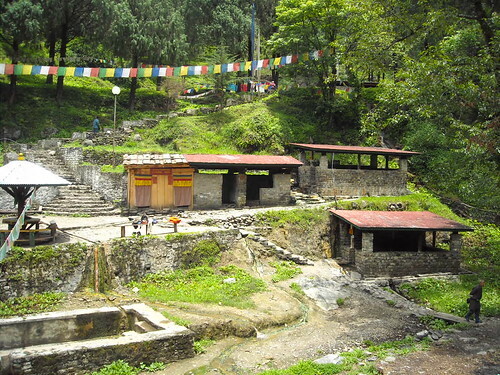 Gasa tshachhu’s [tsachu or tshacchu are Bhutanese for hot spring] historical records are sketchy at best as it is for numerous other tshachhus in the country. Dungtsho Yeshey Dorji of the institute of traditional medicine services says that the country’s ancient traditional medicine doctors discovered the medicinal values of the tshachhus and spread the discovery. Because of their curative powers tshachhus were held sacred by the Bhutanese, many believing them to have been touched by divine hands. It is said that Bhutanese warriors wounded in battles sought tshachhus to soak in and applied the warm mud as salve for wounds. Sometimes they traveled for weeks to bathe their wounds in the water. Traditional medicine doctors have long since been prescribing the healing waters for their patients. Observers also speculate if with modernisation tshachhus would retain their magic for long. In the west hot springs lost out to modern medications which held out the promise for rapid cures of many chronic diseases, which seemed more attractive than several weeks of bathing and other water-related treatments. Physicians were also not all convinced of their medicinal value mainly because no scientific proof existed. But for elderly Bhutanese like Ap Lhap Tshering, 81, from Lhuentse, a regular visitor to Gasa tshachhu, the magic will never wane. "It's nature's way of healing people." The looks like a comprehensive answer. Bhutanese must love soaking. 'During the winter months, many people walk to these hot spring spots or "Tsachus" as they are called. People believe that soaking in this water will cure illnesses, such as stomach ailments, headache, skin problems and the list goes on and on'. Lhaden in the hot springs, Gasa by John Wehrheim. A less well-known tradition is that of dhotsho, a hot stone bath. Stones are heated and then put in a bath tub, i.e. a great Bhutanese alternative to a natural soak. 'Muffy enjoying the hot stone bath at basecamp'. So where are the soak sites? Dur Tsachu (Bhumthang) is the highlight of 10 day trek traversing the Bhutanese portions of the Himalaya without it being too strenuous. The trek is actually named after the hot spring. 'A one day trek from road head. The trek is arduous, but stunningly beautiful. Blue sheep, musk deer and Himalayan bear are common in the Duer Hot Spring area'. Another hot spring (known as Gasa Tsachu) is likewise known as it is en route on the more worn out trekking trails of Bhutan. It is (or was) actually the main destination of a 11 day trek. 'The healing waters of the country’s most famous hot spring now flow under the Mochu river, which has taken a new course after the May 26 flood that completely washed away the five soaking ponds and the VIP bathhouse built around the spring'. 'With the monsoon season almost over the restoration work of Gasa Tsachu will be carried out very soon'. 'This area used to be green, lush, and developed with many tubs before the flood in 2009. There is now one pool in the hut and an other outside, along with the bathing area to the lower right of the pool'. 'Gasa Tshachu trek is no more an attraction after the hot spring was washed away by the flood this year. Now there is dirt track just four hours walk from Gasa and two hours from the hot spring site'. 'Passang, 55, a horseman from Zomina, said before the arrival of the road, he used to get Nu 400 for a horse to carry a person and his luggage from the road end at Tashithang to the tshachhu [Gasa hot spring]. But now, he gets only Nu 300 for a horse. He said the coming of the road would directly affect the livelihood of about 100 horsemen'. 'The hot springs have five ponds. Each is fed from the different springs and each treats a different ailment. Though there are bathrooms and shower rooms and a notice instructing the visitors, ‘Do not enter the pond before taking shower from this bath house’, people enter the ponds without taking bath and that too with their dirty clothes on'. Some things never change or do they? 'In the past, visitors relieved themselves in the open and farmers brought domestic animals - pigs, horses and cows to the tshachhu for broken joints and other ailments. Animals are now banned from the tshachhu'. '... Nye [hot spring] in Kurtoe, Chuphu in Punakha and Dunbang in Zhemgang. They are all difficult to reach and entail more than a day’s walk through the rugged terrain'. All three have no references on the internet other than this source. Erik Skydive's picture on Gasa TsaChu as it was. 'Koma Tsachu (Punakha) is a vigorous two hour walk from the small community of Mitesgang. There are three bathing pools covered by simple rooves, and a four roomed building with solar lighting where sleeping bags and mats can be laid (there is no charge for staying in the building). Outside, there is ample room to pitch tents and rock overhangs to camp under(source)'. Then there is an excellent report on a visit to Koma Taschu by Phuntsok Rabten published in the Bhutan Observer (26 April 2008). 'Nestled alongside the creek in this picturesque jungle were the three pools of the hot springs. Amongst the scattering of tents and makeshift camps were two public toilets, three outdoor running taps and a most decent guest house of five rooms and two attached bathrooms, facilitated with solar electricity and water supply. Here, the music of modern amenities played in rhythm with the wild beat of the jungle drums. Koma Tsachu sees revelers and visitors round the year. Spring-time sees the most influx while the student hordes invade the tsachu during holidays. There were about 30 people when we arrived'. '“A new suspension bridge will be constructed next year,” he said. Meanwhile the travellers through the tsachu zam are advised to be careful while passing through this bridge. People as far as from Thimphu and Haa in the west and from Trashigang and Trash Yangtse in the east visit the Dunmang tsachu from November till march. The tsachu’s three ponds with water temperatures measuring between 42 degrees to 52 degrees, is believed to cure diseases like tuberculosis, and sinusitis besides healing aches and wounds. A village elder from Kheng Gongphu said that the temperature of the water had been decreasing over the years. “We used to boil eggs in the tsachu not long ago,” said Ap Sangay, 90. “In the absence of hospitals in the past, the tsachu was very indispensable for us.” Thousands of people visit the tsachu every year'. Gelephu Tshachu seems less well-known. Kuensel reports today that renovations were on the horizon. 'It will be the first major renovation since the hot springs were opened to public in 1962'. Possibly in reply to an earlier this year published report in the Bhutan Today. It mentions inadequate bathing facilities, a decrepit guesthouse and non-existent toilets. '...the outbreak occurred after an old couple infected by conjunctivitis soaked in the Tshachu'. Duethang in Ura, Bumthang is expected to be another better developed hot spring site.